Chari dance is one of the popular folk dances in Rajasthan India. This dance describes the art of collecting water in a chari or pot by the Rajasthani womens in their day to day life. The woman’s travels miles to collect water for the families and the joy is reflected through this Chari dance. This folk dance is performed by groups of dancers. In chari dance woman hold chari or pots on their head and a lighted lamp is then placed in the pot. The famous Chari dance belongs to Gujjar community of Kishangarh and only womens perform in this dance. These ladies carry brass pots on their heads balancing it to perfection. These pots are kept ignited with the cotton seeds dipped in oil. These lit pots display beautiful effect in the dark night. While performing the Chari dance woman dance with balancing brass pots (Chari) on their heads and move together and dance on a same sequence. This dance does not have any particular movements except balancing the pots on their heads. This dance is also known as a welcome dance and is a significance of goodness. 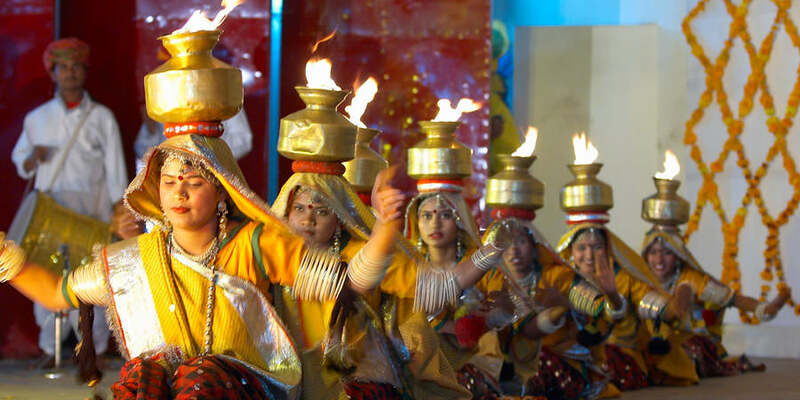 It can also be considered as the traditional fire dance of Rajasthan. The Gujjar womens dress traditionally in colourful Rajasthani dresses while performing the Chari dance. The dancers wear big nose rings, on top of their heads they wear khol(define) of coconut. Sampan ladies wear gold ornaments, Hansli, timniya, mogri, punchi, bangdi, gajra, armlets, karli, tanka, navr are the main ornaments. The background Rajasthani folk music is also one of the reason for the attraction towards this dance . Instruments like dhol, dholak,bankiya, harmonium, nagada and thali.are are used to make folk activity more colourful.